The European Mole (Talpa Europea) is the only mole in the British Isles. It is only found in England, Scotland and Wales. There are no Moles in Ireland. The mole is the only pest that has not been introduced by man. It is currently estimated that there are between 35 and 40 million moles in the British Isles. Moles live entirely underground and are able to function in complete darkness using their highly developed senses of hearing and smell. They do have covered eyes and can differentiate between light and dark. Moles are very good swimmers who not only can cross rivers but also survive if their tunnels become flooded. Moles are in the main solitary animals. ​They closely guard their territory and will on occasion fight to the death to protect it. Moles breed once a year normally in the early months and the females normally have a litter of 3 to 5 pups. The pups are fully matured after approximately 5 weeks when they are fully weaned and leave the nest to find their own territory. As a result this is the time of year that their activities become more noticeable. Mole pups do not normally breed in the first 12 months of their life. ​It was estimated some time ago that there are 15 to 20 million female moles in the UK. If each of these have 3 to 5 pups a year that could mean that at least 45 million moles are born each year, which means a lot of molehills! Moles feed on worms and grubs and are classed as Insectivores. They have to eat 60% (approximately) of their body weight daily to survive. Moles do not hibernate. They work 365 days a year on a 4 hourly cycle. The tunnels they dig are purely dug as worm traps. The worms drop into the tunnels and are then caught and eaten by the mole. If he does not eat them immediately he stores them in a worm larder for consumption later. Moles will tunnel until they find a food source. One mole can tunnel up to 20 yards a day in search of food. The molehills they produce are the result of them creating new tunnels. Moles can travel above ground especially during mating season when they are searching for a partner. This can be potentially hazardous for the mole as it is exposed to predators such as cats and birds of prey who it would not under normal circumstances have to contend with. Moles are cannibals. 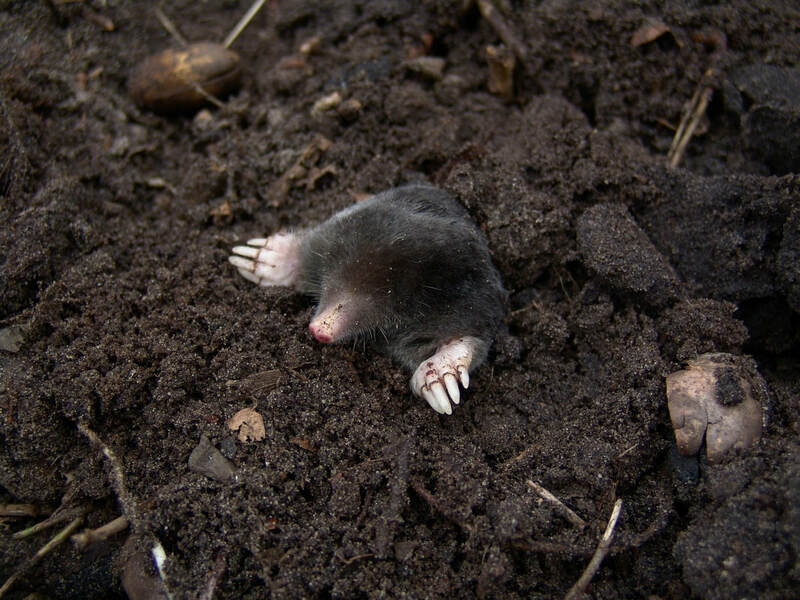 If a mole comes across a mole in a trap it is not unusual for them to eat the trapped mole. The mole population has grown substantially since the ban on the use of strychnine for mole control in 2006 and also the reduced use of insecticides on farms. ​Contact me for more information and to find out how I can help with your mole problems.